MICHIGAN STATE (US) — Selling a kidney or part of a liver to repay loans is becoming more common in Bangladesh, where traffickers of human organs exploit desperate villagers. In a small village near Joypurhat in northern Bangladesh, Selina Akther sold a kidney to repay her husband’s microcredit loans and now suffers from daily pain and the scorn of fellow villagers. Her husband, brother-in-law, and father-in-law also each sold a kidney. The brother-in-law, Mohammed Saharul Islam, says he was in a “dire economic situation” because he couldn’t pay back multiple microcredit loans. The collateral-free loans (with an average size of about $50) allow villagers to start small businesses such as a chicken farm or food stand, although critics say the popular program can quickly lead to a dangerous cycle of debt. “I sold my kidney from the pressure to repay the loans,” Islam says. Monir Moniruzzaman, a medical anthropologist at Michigan State University, is documenting the disturbing trend as part of his latest research. Twelve years ago, when Moniruzzaman started researching human organ trafficking in his native Bangladesh, it was relatively rare from village to village, an underground phenomenon. Today, the illegal sale of organs from living donors is so pervasive in the impoverished country that entire families have been exploited, transplant centers are much easier to find and husbands commonly pressure their wives to sell an organ, Moniruzzaman says. 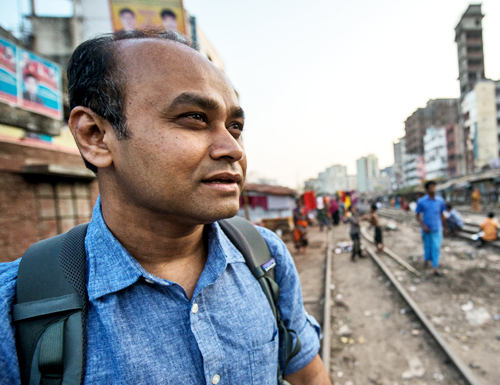 With his latest research Moniruzzaman is documenting the many ways organ trafficking has infiltrated Bangladesh. This includes the growth of the human liver trade in which poor, vulnerable residents are fooled into selling part of their livers under false promises that they will get rich from the sale and that the liver will grow back. In Bangladesh, a patriarchal society where arranged marriages are common, husbands regularly persuade wives to sell a kidney or part of their liver in hopes of paying off debt and climbing out of poverty. Because organ-sellers often remain in poor health and unable to perform manual labor, these men argue they cannot donate another organ themselves and that it falls to the wife. While the wives are the initial “target,” Moniruzzaman says the men also persuade other family members by promising them wealth from the recipient that rarely materializes. The number of transplant hospitals in the Bangladesh capital of Dhaka has increased from one in 2005 to nearly 10 today, as hospital officials and doctors realize how lucrative the black market for human organs has become. Moniruzzaman says organ sellers are exploited by unethical brokers and recipients who are often Bangladeshi-born foreign nationals living in places such as the United States, Europe, and the Middle East. Because organ-selling is illegal, the brokers forge documents indicating the recipient and seller are related and claim the act is a family donation. Many of the sellers are uneducated and do not understand the importance of the liver and kidneys. Moniruzzaman has delivered his research findings and recommendations on organ trafficking to both the Tom Lantos Human Rights Commission of the US Congress and the US Senate Committee on Foreign Relations. Among his recommendations, he says the United States should play an active role in helping the global community recognize and crack down on organ trafficking in Bangladesh and elsewhere.